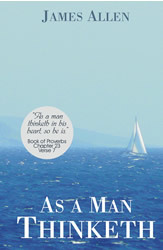 In this classic self-help book that spawned a new era of thought, James Allen writes that a man is literally what he thinks, his character being the complete sum of all his thoughts. Before The Secret and The Law of Attraction, Allen’s teachings were inspiring those who seek to better their lives through personal revelation. Book is 4.25"x 6.5", 20 pages, full color soft cover, black and white interior, Saddle Stitched. Cover art varies.